The BEST Rice Krispie Treat Recipe EVER! 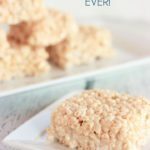 | The Best Rice Krispie Treat Recipe Ever! The BEST Rice Krispie Treat Recipe EVER! These treats are ooey gooey goodness! Dump into an 8 x 11 greased dish. Use a greased spatula to spread out the treats and press down just a bit (you don’t want them to so compact that they become rock hard). Allow to fully cool before cutting and serving. Depending on how you cut the treats will determine how many a batch will make.